If you are looking for free protein on your first order or want to find out how to earn enough TPW™ Loyalty Points to get your supplements for free, you are in the right place! £5 into your TPW™ account for FREE! 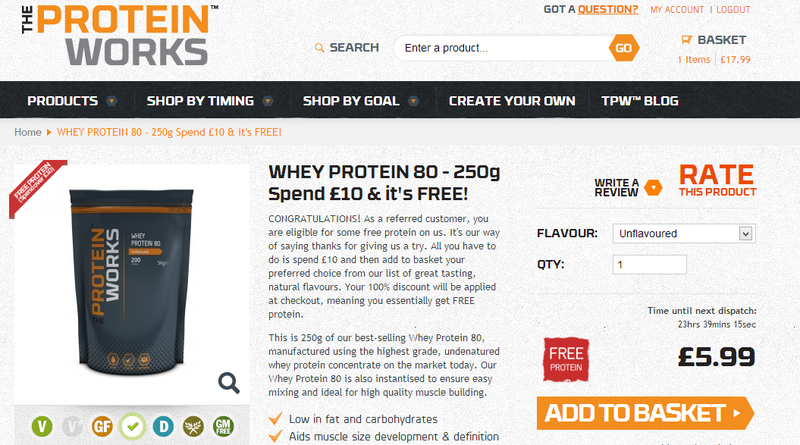 250g of Whey Protein 80 (concentrate) ABSOLUTELY FREE! The first thing to do is to find your own unique TPW™ Referral Code which can be found in the ‘My Account’ Section which you access through the top right corner of the page. Now over to you! Simply post and promote this code wherever you can online across forums, website social media and also offline at work, down the gym, supermarket notice boards. We include TPW™ business cards in your order so you can write your code on them and hand them out to mates, pin them up down the gym, reception at work, etc. The more proactive and entrepreneurial you are, the more cash you will have to spend on TPW™ supplements. Once you’ve sent your code to all your friends, you can then track how many people have used your code (and therefore how many TPW™ Points you’ve earned) in the ‘Loyalty Points’ section down the right side of ‘My Account’. We will also send you an email each time someone you recommended buys from us. You can even invite friends by email from within your TPW™ account as shown below. Please read the programme's terms & conditions before starting to recommend us and getting that your TPW™ Code viral! 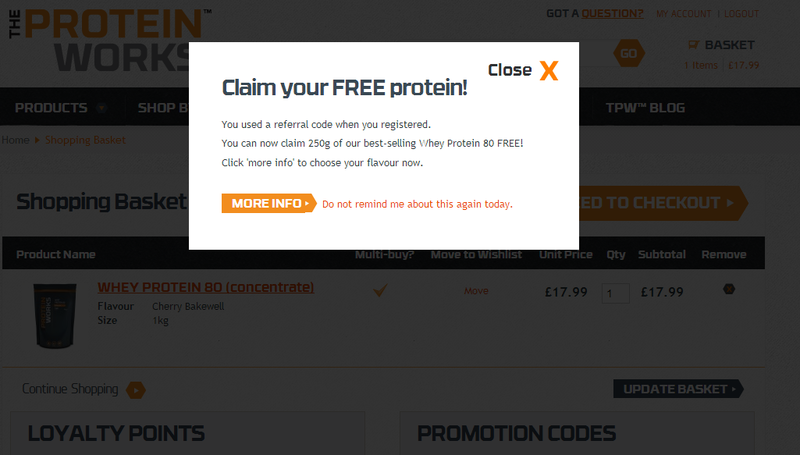 Now if you’re new to TPW™ and a friend has recommended you and given you their referral code, it’s so important you enter it in the correct place so you receive your FREE 250g of Whey Protein 80 (concentrate). You will then be taken to a page on the site where you can select which flavour of our best-selling, premium grade Whey Protein 80 (concentrate) you want to receive absolutely free of charge! Once added to your basket you will then be taken back to the checkout where the price of the 250g of Whey Protein 80 (concentrate) will be deducted from your order. We hope you enjoy your TPW™ supplements and become a loyal customer. Find out how you can earn some serious cash to spend on future TPW™ orders here. Please also read the programme's terms & conditions before starting to recommend us.